For over 15 years, Privia pianos have delivered a pure piano experience for any situation. Now, the PX-S3000 brings a fresh new design into the Privia family of instruments, making brilliant technology a part of your musical life. The PX-S3000's striking design fits any room, any decor, and any mood. Its sleek, glossy top panel and unibody case evokes a luxurious acoustic grand, in a gorgeous case that's barely larger than the keys themselves. There's never been a keyboard this slim that feels this good. 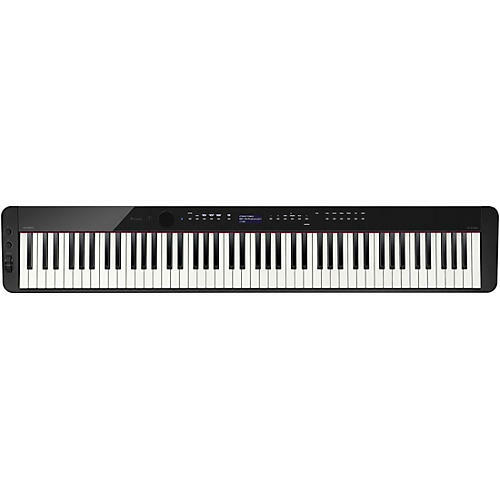 The superior touch of the PX-S3000 is thanks to the newly designed fully weighted Smart Scaled Hammer Action Keyboard, which delivers an authentic and uncompromising piano touch with an incredibly small footprint. Casio’s proprietary key scaling system reproduces the individual characteristics of each of the 88 keys, while ebony and ivory key textures ensure confident playing in any climate. The PX-S3000 includes 700 stunning Tones including a breathtaking stereo grand piano. Advanced string resonance exposes the harmonic relationships between vibrating strings, while damper resonance adds depth and richness. You'll even hear the damper rise and fall when the pedal is pressed, along with the subtle mechanical sound of the keys being played. Hammer response and key-off simulation deliver even greater detail, reacting naturally to your playing dynamics. With the PX-S3000, the piano is just the beginning. Play an electric piano, and hear vintage phasers and amplifier models that take you back in time. Play a flute, trumpet, or saxophone, and hear natural breath and vibrato. Play a bass, and hear the player switch techniques based on how hard you press the keys. Play a synth, add an arpeggiator and drum part, and create the next EDM hit. The list goes on. In each category, you'll find an incredible variety of lifelike instruments that go far beyond your expectations. The PX-S3000’s touch sensor controls are revealed only when the power button is pressed, and are easy to see and use in any light. They disappear when powered off, leaving only a clean, seamless top panel. The PX-S3000's top panel presents you with only the controls you need, and hides the ones you don't. If you aren't using the onboard Rhythms, those controls will simply fade to black. Engage the Rhythms, and the controls will reappear. A bright backlit LCD display keeps you informed and makes exploration a breeze. A powerful stereo speaker system delivers crystal-clear sound towards both the player and the audience, and is engineered to sound accurate when facing a wall, placed on a table, or in an open performance space. The speakers project towards the player from subtle ports just above the keys, and towards the audience from rear-facing drivers with a beautifully designed grill. Two headphone jacks allow quiet play at any time. The PX-S3000’s newly developed Sound Mode gives your playing new perspective, with two immersive modes that surround you with your music. Going even deeper, you can select from four types of Hall Simulator to place your PX-S3000 in the virtual concert space of your dreams. Privia pianos are already known for replicating grand piano sound and feel in a compact package, but the PX-S3000 will make you rethink how portable a piano can be. It's 43% smaller than the previous generation Privias and takes up literally less than half as much space as its competition, while retaining true piano touch and sound. It fits anywhere you need a piano: On a table, on a counter, on a desk, on your bed, the list goes on. Weighing under 25 pounds and with optional 6xAA battery power, the possibilities are endless.